Street Address : 46 Montreal St. 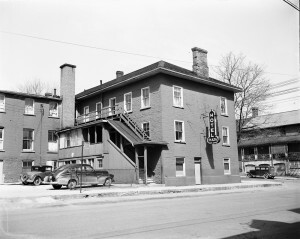 The Office, Kingston’s first official gay bar, opened in the early 1980s on the corner of Montreal St. and Queen St., in the upstairs section of what is now Kingston’s only strip bar, the Plaza. Although the Office was the first openly gay bar, a number of other gay bars have occupied space at the Plaza, until as recently as 1997, when Dreammakers, the last lesbian bar in the building, closed its doors. Since the opening of the Office, a number of gay bars have occupied various Kingston locations, including Robert’s Club Vogue, which then became Club 477, a reference to its address at 477 Princess; Wally’s, a dance bar on Bath Road; and Shay Foo Foo’s martini lounge in the basement of the Rest Inn on Princess Street, the recent closure of which has left Kingston without a gay bar at the time of writing. Although openly designated “gay bars” did not exist in Kingston before the early ’80s, this absence did not stop gays and lesbians from carving out a place for themselves. Instead, local queers negotiated spaces in “straight” drinking establishments, spaces that were, by definition, shaped by the dilemma of needing to be visible to queer people while remaining invisible to the surrounding heterosexual clientele. Just as gay men could cruise the park as long as they remained a subtle, somewhat hidden, presence, lesbians and gays occupied space in bars on the condition that their behaviour did not visibly transgress conventional sexual norms. The list of gay-tolerant bars is surprisingly long: the Elbow Room, the Cat’s Meow, the Indian Room, the Wagon Wheel, The Grand, Chez Piggy, and the Black Sheep Inn. 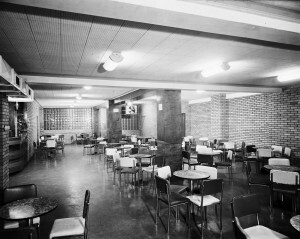 Except for the Black Sheep Inn and Chez Piggy, all the gay-tolerant bars were primarily working-class institutions that accommodated a mixed-class clientele. Male and female narrators discuss the significance of these sites differently. Male narrators focus on gay-tolerant drinking establishments as prime cruising areas, while female narrators are more likely to discuss the bar as a place to build on existing friendship networks and meet potential partners. Kingston balldykes remember going to the Indian Room (in the Prince George Hotel on Ontario street, now the site of the Tir Nan Og) to “drink, get drunk and play cards” after a ball game, and heterosexual and lesbian feminists involved with the Kingston Women’s Centre occasionally went out for a drink at the Plaza.